The neighborhood’s favorite little cheese shop just catapulted itself into a whole new category with a new Smith Street address. Stinky Bklyn is now truly a marketplace, and one that opens at 7:30 a.m. weekdays. 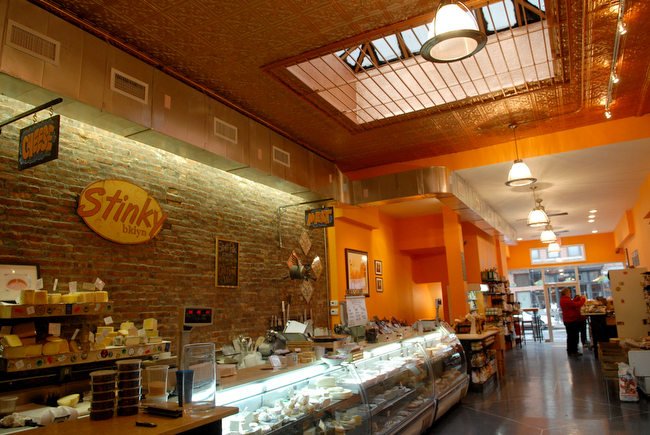 Stinky Bklyn’s two-block move north from 261 Smith Street to 215 Smith Street between Butler and Baltic has about tripled the store’s capacity. Though familiar items–cheese, charcuterie, pickles, pastas and gourmet condiments–still line the shelves, customers who had grown used to elbow-jostling and the intimate space of the old store may get flustered with all that room to move around. Cartwheels could be executed without disturbing the display of Bittermens bitters, McClure’s spicy bloody mary mix, specialty spices and condiments and small-batch sodas. In addition to dry goods, the shop is now offering select fresh produce–currently onions, potatoes, kale, apples, celery root and garlic. 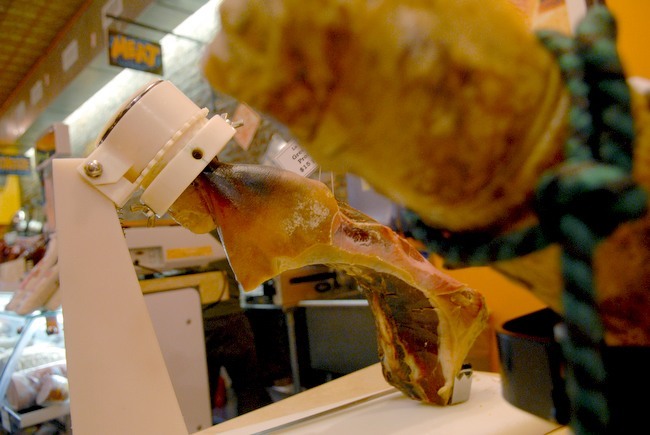 When Patrick Watson and Michele Pravda first opened Stinky Bklyn in June of 2006, the shop was at the forefront of Carroll Garden’s gourmet movement (the two also own wine shops Smith & Vine and Brooklyn Wine Exchange). A lot has changed since 2006, with gourmet, organic and locally-sourced goods becoming the norm in grocery stores and specialty shops sprinkled throughout brownstone Brooklyn. If diversification is the key to luring shoppers–certainly a Union Market strategy–then Stinky Bklyn seems poised to nab its share of the client base, even if extra room to move means some of the tight-knit charm of the original shop has been lost. Indeed shoppers have much to choose from in the nearly cavernous space: House-made prepared foods, Char No. 4 bacon, Dickson’s Farmstand Meats burger patties, cereal, milk, butter and whole chicken. 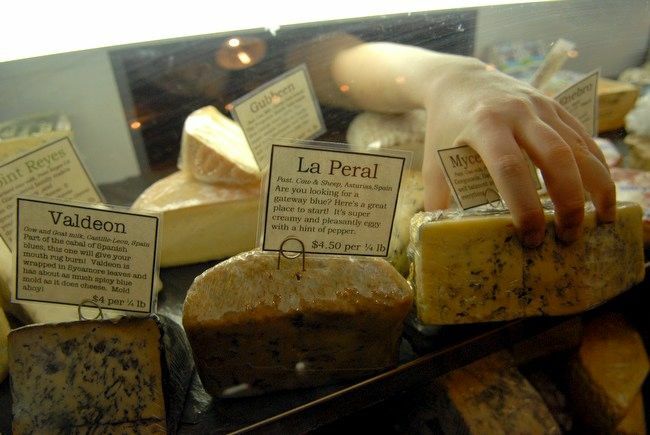 There’s no doubt that the 75 to 100 cheeses–aged in the store’s own cheese cave–and the ham bar with a rotating selection of hard-to-find hams will continue to draw crowds. Stinky is looking to diversity its clientele. For early birds, there’s morning coffee from Brooklyn Roasting Company, pastries from Balthazar and copies of The New York Times and New York Daily News. Once the liquor license is transferred, customers can nab specialty six-packs and have growlers filled from a choice of six taps. When the weather warms (will it ever? ), expect classes on cheese and beer in Stinky Bklyn’s outdoor space. Gift baskets, cheese-of-the-month club and summer cheese-eating contests remain untouched. Mon-Fri 7:30 a.m. to 9 p.m.